After a fairly long gap for Ghost, and a lackluster first set, Ghost emerges from an ambient Golden Age. Golden Age and Ghost were serious business, and then the rest of the set would take a lighter turn. The end of the Golden Age segue has been included. Out of a dark and spacey Golden Age ending, Ghost emerges from the depths of darkness. Trey brings the Ghost in slowly, and it emerges nicely. Gordon adds the bass and Fishman works the beat. A note from Trey stays looping in the background. You might need your head phones on to hear it, but it is definitely there for quite a long time. In fact it doesn’t end until the solo section. The solo section gets a bigger dose from Trey than usual. Page doesn’t dominate as much, and Mike throws in some nasty funk. Nothing exceptional. The lead in is well played, and we get a pause with another lingering Trey note. It is pretty short and leads to a pretty sweet drop in. They drop in with authority, and it gives that great energy heading into the jam. Mike lays down a big fat bass groove right away. Page jumps on the clav and sleeks around the groove. A nice minimalist groove forms before Trey even touches his guitar. Trey doesn’t chime in until the 4:26 mark. Love it Trey! Let the groove form before you choose your path. Even when Trey enters, it is only with a couple minimal chords. This maneuver from Trey creates a nice funky bluesy feel to this opening section. I am swaying and feeling each note Mike drops. When Fish changes up the beat at 4:52, that is Trey’s queue to enter. He does so with slyness, and he injects himself perfectly. Trey works right into the jam, instead of derailing it and forcing it to change direction. This is something Trey did more often during 2012 and it is music to my ears. The jam was built before him, then he took it to the next level. Trey chooses a classy, old style blues type of soloing. Not one band member is over playing, instead each note has more meaning, and the band produces one sound. Page begins to move to the piano at 5:42, and then the band slows down the tempo for a second. Trey responds with a cool lick at 6:07. This is groove city. Underneath that gorgeous pavilion at Blossom, it is time to sit back and enjoy the night. At 6:23 the Chairman starts to put his stamp on this jam. As try finds a higher pitch, and Fishman works the cymbals, it is Page’s piano that moves my soul. One incredible melody after another, Page leaves his mark. Although, Page grabs my ears, the best part is how well the band is working as a unit. As I mentioned a second ago they are definitely producing one sound. This allows me to float way from all cares, and float in the clouds. Hard to be in a bad mood when something so uplifting touches your ears. Life is good, when Phish is involved. The best part? We have incredible recordings that will be with us forever always bringing us joy. The transition from the nice uplifting music is crazy. Page plays a nice happy melody at 8:51. Then Mike drives things dark and Trey jumps into the mix IMMEDIATELY. Page says “F this light stuff” and we get dark in a hurry. And a Casper the Helping Friendly Ghost jam has been replaced by a Ghost from Michael Jackson’s Bedroom. Not to mention this gif works, because of how quickly we are heading into that dark abyss. This dark ambient section is one of my favorites. It is mind blowing to me how quickly the band is able to lock in. It is balanced, it is dark, and most of all it is freaking awesome. The lick Trey drops at 9:33, feels like it could be in a horror movie and yet somehow makes me want to dance. This is well removed from anything that remotely resembles Ghost. This is what I am talking about. Page plays two notes at 10:04 on the piano, then works them longer on the organ, creating even more evilness. Then he comes back to the piano and drops daggers of light. Page F’ing rules. So you love MSG Carini? Well part of it was born two days before this during the Cinci Twist, and even more was born during this jam. The band is always evolving and learning. Things start to space out from Trey, as Page works more piano notes into the equation. Things begin to fade away, as the band works a crazy segue into Sweet Virginia. Another extremely cool version of Ghost. Unique from any other. The jam gets a nice bluesy groove, but the magic is in the last section. Dark, and beautiful. The darkness is even cooler when you think about how sharp the contrast is and how lighthearted the rest of the second set turns out to be. 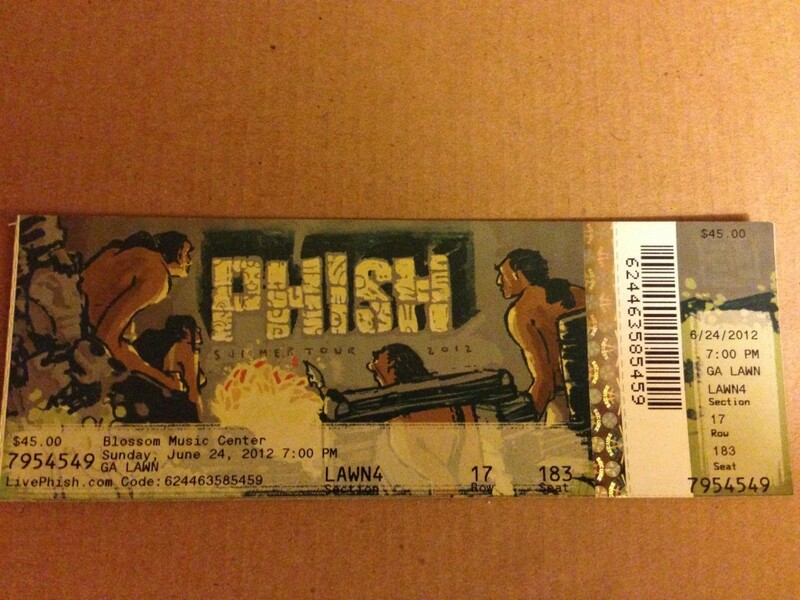 Another great job by Phish in 2012 of taking chances and finding great rewards.